The U.S. Spot Index slipped by 1.4% this week to settle at $1,142 per pound. Although several mid-sized markets saw notable increases in their Spot Indices this week – including Massachusetts and Illinois – that upward price pressure was overwhelmed by declines in the composite rates of California, Colorado, and Oregon, with the West Coast markets just mentioned each seeing decreases of over $30 compared to last week. As of this week, the tug-of-war between the upward-trending national price for warehouse flower and the slowly-sliding U.S. averages for greenhouse and outdoor product saw the latter gain the upper hand. 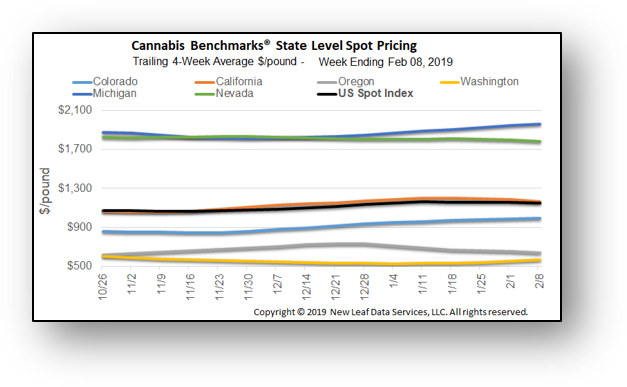 Elevated rates in California have for the time being buoyed the national price for indoor flower against sliding prices for such product in Colorado and Oregon this year. Fortunately, this graph does not represent anything close to actual pricing for us in Wa! Maybe for 2017 and older outdoor this is right. Spot pricing isn’t necessarily what everyone gets, it is an average on the commodity side for immediate payment, outright bulk purchasing. You could be sure that top end is getting at least double and maybe up to triple, possibly more in certain situations, but this isn’t the norm either. Bottom end is half to maybe even 1/3, again depending on numerous factors. Net 30/60/90 deals also change actual price. It is more of a comparison than actual pricing.